“Dynamic Impressions of Collective Dances in Detroit Jam” by Lucía Naser for CQ delves deep into our co-created experience of the Detroit Jam 2014, along with Miguel’s Photographic evidence of the proceedings. This event was completely volunteer run! 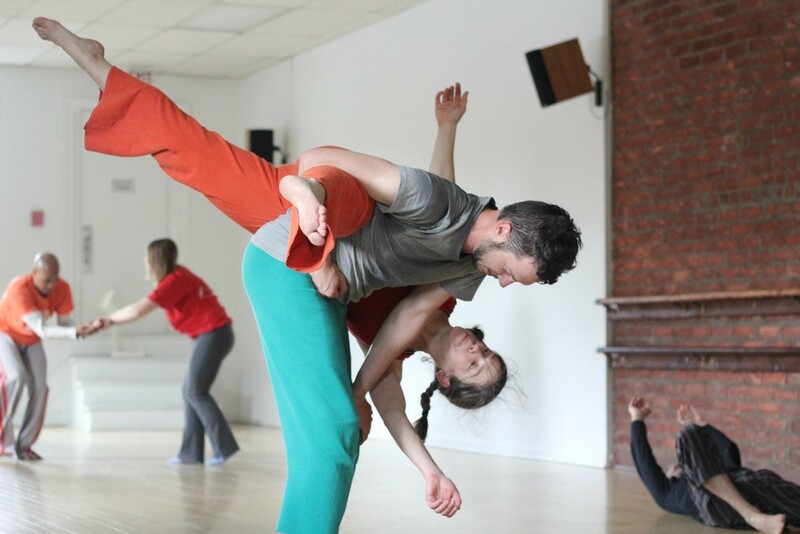 Setting the stage for dynamic dances, we will employ our curiosity to playfully explore core Contact Improvisation principals: connection, flow, grounding, supporting/giving weight, taking care of yourself and having the dances you want to have. This class will introduce brand new dancers to the form and re-invigorate those with more experience. Calling into play our whole sensorium, we will explore the interpersonal dynamism that emerges when we evoke our inner tricksters. We will PLAY with surprise, rhythm, opposition, exaggeration and especially resistance to create dynamic, fun and powerful dances. Connecting honestly to ourselves, the ground and each other, we will challenge ourselves to remain curious, direct, and adaptable while creating a dance full of surprises. Building on our solid foundation of connection, grounded-ness, support, and flow, we will take the dance into the air. After practicing safe and effective techniques for both supporting a rider and riding a supporter, we’ll take flight by offering and enjoying the often surprising, always thrilling small rides. Then, taking it to the next level, we will explore the physics of force, resistance, and momentum as tools to keep the dance flowing into and gently out of the air. Shel Wagner Rasch, our special guest facilitator, is a Los Angeles-based Contact Improv dancer, teacher and producer. 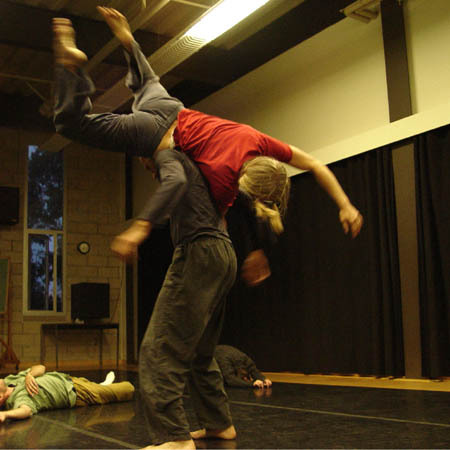 She teaches Contact at UCLA, and over the past decade has been a featured guest artist at workshops in multiple college settings, festivals, and studios, including the West Coast Contact Improv Festival and, in its most recent incarnation, WCCIJam. Her scores and choreographies have been widely commissioned and she is a recipient of the Lester Horton Award for Excellence in Choreography. Shel currently co-hosts the Eastside Lab Jam in Pasadena and has a private practice in Los Angeles as a Somatic Experiencing Practitioner, Alexander Technique teacher and Pilates instructor. She also collaborates with her husband, animator Justin Rasch, making stop motion animated short films. Announce to your local jams. Tell us you did so. Print and post the Detroit Jam 2014 Flyer (PDF) or JPEG ! Invite your contact improv friends near and far. Let’s get a dozen States & Provinces representing in The D! Can you offer housing space near Detroit for delightful out-of-town dancers? How about your friends & neighbors? Let us know what you can offer and how many people you can accommodate. Deco Dynamisist: manifest visionary artscape in the Great Room. Legal Eagle: prepare liability waiver doc; 2) determine other legal needs, if any. Photo Phantasmatist: Document the doings and dancers with high quality imagery. Are you a very experienced dancer willing to give some focused attention to creating a welcoming, encouraging environment; reaching out to new dancers; offering some 1:1 instruction? Talk to us. If you’re feeling abundant, extra money will support work-exchange positions, scholarships, and also make other things possible (paying musicians, great food, et cetera). Part of the vision for the jam is to keep it affordable and accessible. James Cornish (trumpet, violin, flute) has established himself as a leader on the Detroit improvised music scene. He works in many different contexts, sometimes collaborating with noise and rock musicians, but is best known for his uncompromising commitment to contemporary spontaneous compositions. He often collaborates with dancers and visual artists in interdisciplinary contexts and has created musical settings for contemporary poetry in his Short Opera projects. Cornish is the recipient of state and national arts grants, including American Masterpieces: Three Centuries of Artistic Genius (2009). He was commissioned to compose a series of dance pieces in public spaces in Detroit (2011). Jordan Schug is a cellist in the Detroit Area. He studied both jazz and classical music at the University of North Texas (ranked one of the top music schools) then returned to Michigan to continue his professional music career. Also well known as a Jazz Double Bassist, Jordan has performed at the Detroit Jazz festival for the past three years in a row. He has shared the stage with many world class musicians, and is currently attending the University of Michigan School of Music for his graduate degree on scholarship. Jae Rowe is an artist, drummer, and percussionist who has played with countless groups over the past 15 years. As a session musician, he has recently played with His Name is Alive and other local recording artists. The constant evolution of his work comes through in current projects including Westerbur and Rowe recordings. Diana Nucera, world class cellist, teaching artist, and Media Maven has been immersed in the media arts and technology for over thirteen years. She has performed with internationally-renown artists such as Matthew Barney and Invincible, in addition to being a core member of multiple music projects in Detroit, including The Rarities & Stevie Soul. Diana builds multi-media creative centers where ever she goes and is a Co-Director of Allied Media Projects managing media and technology educational programing in Detroit. Note the Studio will always be available for open jamming & labbing during structured activity in the ballroom. spirit. Send a statement of your needs, availability, special skills. Apply early – these opportunities are limited. You also need to register. Parking available onsite & on street nearby. Both spaces are wheel-chair accessible. This Detroit Jam is also known as “Mini-GLACIER” as we are a regional nexus for the larger Great Lakes Area Contact Improvisation Enthusiasts Retreat (GLACIER). 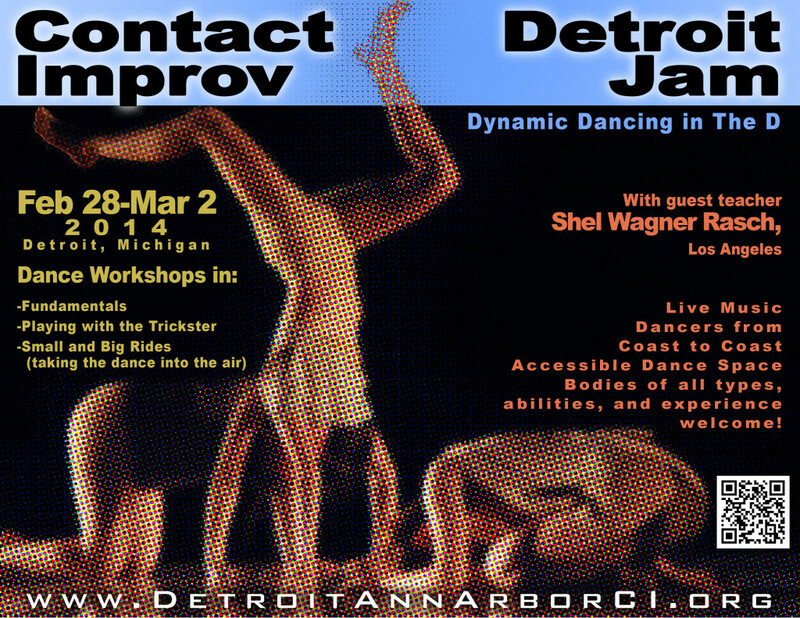 Detroit Jam 2014 Flyer (PDF) – please share!